Coca-Cola will launch its newest soft drink in the Australian market in April 2015. 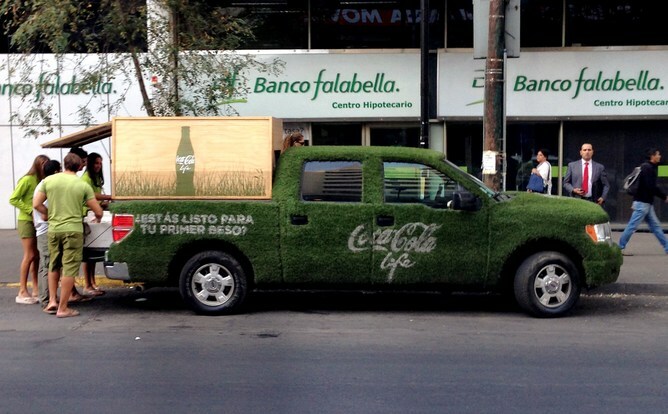 Branded Coke Life, this newest offering has been heavily promoted as the “healthy” Coke. Unfortunately and certainly, unsurprisingly, a quick glance at its sugar content indicates that this newest offering is nothing more than a money making marketing exercise. The decision to package Coke Life in a green bottle has been guided by research which indicates that adults and children perceive food with green packaging, or green nutrition labels, to be healthier than identical food packaged in other colours. Coke Life is promoted as a lower sugar alternative due to its partial sweetening with Stevia (a natural sweetener) however, it still contains a whopping 22 grams of sugar. Sure, this is less than the 35 grams you will gulp down from a regular Coke, but a healthy alternative? Well, not so much. At 89 and 139 calories per can of Coke Life and Regular Coke respectively, these options are substantially higher cal than Coke Zero, which contains only 1.1. So why the need for Coke Life? Well, consumers are becoming increasing wary of artificially sweetened products, leading Coke to develop this ‘safe’ alternative and put consumer concerns at rest, all while maintaining sales. However, when we consider the colouring, caffeine and phosphoric acid in addition to the 22 grams of sugar in Coke Life, it is apparent that this drink is anything but a healthy choice.